Have you ever scrolled your own Instagram for outfit ideas? I’m guilty of this! It’s actually a killer archive, especially if you snap daily pics of your outfits. Even if you keep the pics to yourself, having a visual inventory of your closet is a great way to find “new” ideas. I loved this sweater and tank top together in a blog post three years ago, so I pulled it out and wore them with jeans all over again! Approx. dates: Tee is 6 years ago. Sweater is 4 years ago years ago. Boots are 3 years ago. Purse, jeans and earrings are recent. We are proud to partner with Nordstrom and ShopStyle for today’s post. Sponsors are carefully selected in conjunction with our mission statement to bring you style content we think you’ll love! All opinions and editorial decisions are solely my own. My level of excitement during the holidays ranks somewhere around Buddy-the-Elf, especially when it comes to getting dressed up. The glitz! The glam! All the wonderful opportunities to see family and friends! And yet as much as I love it, I still want everything to be affordable and convenient. Is that too much to ask? Not at ALL when you check out one of my favorite holiday style secrets: Nordstrom! The four dresses I’m wearing in today’s post, and everything below is under $100. 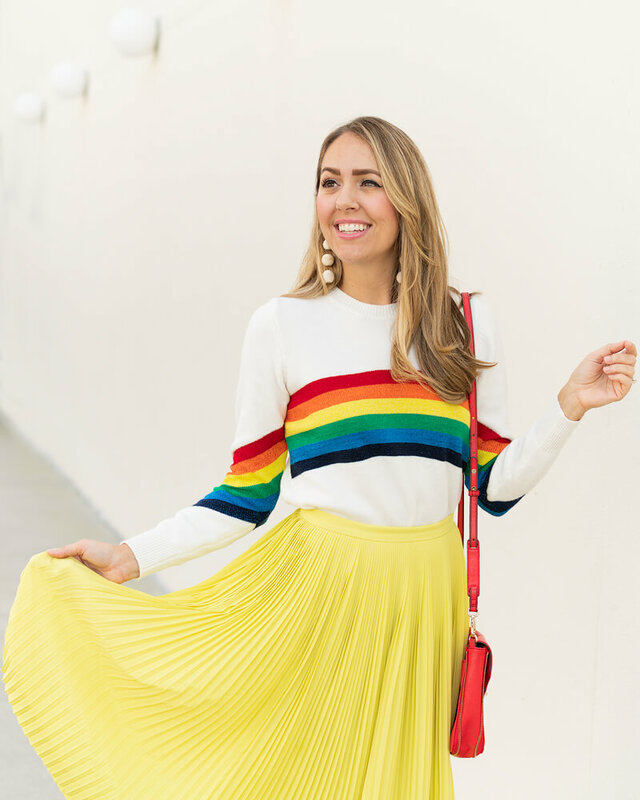 Nordstrom has something on a budget for everyone – no matter the color, shape, or size you are looking for, and no matter the occasion. 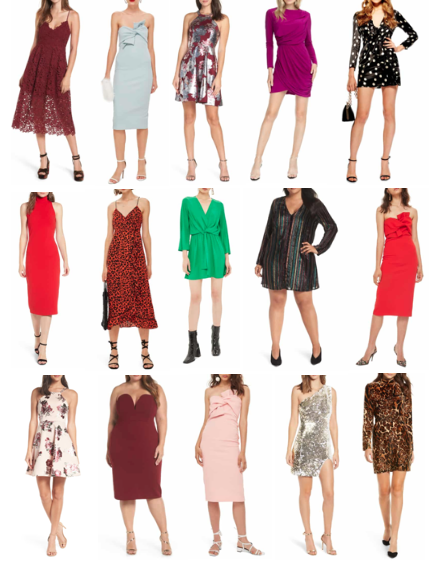 Whether it’s sequins for New Year’s, red for Christmas, or pastels and prints for your next holiday parties and soirees – they’ve got it. Not to mention they make the holidays a little less chaotic with helpful services like curbside pickup, free alterations and free shipping in both directions. Head on over to Nordstrom to check out all the stylish options they have to make your holidays a little more merry and bright! If you also purchased this sweater recently - or already had one like it in your closet - here’s another way to wear it! In my first outfit, I paired it with jeans, sneakers and hot pink accessories. This look is so different it hardly feels like the same sweater, and gives you even more bang for your buck by making it work for occasions beyond weekend casual. 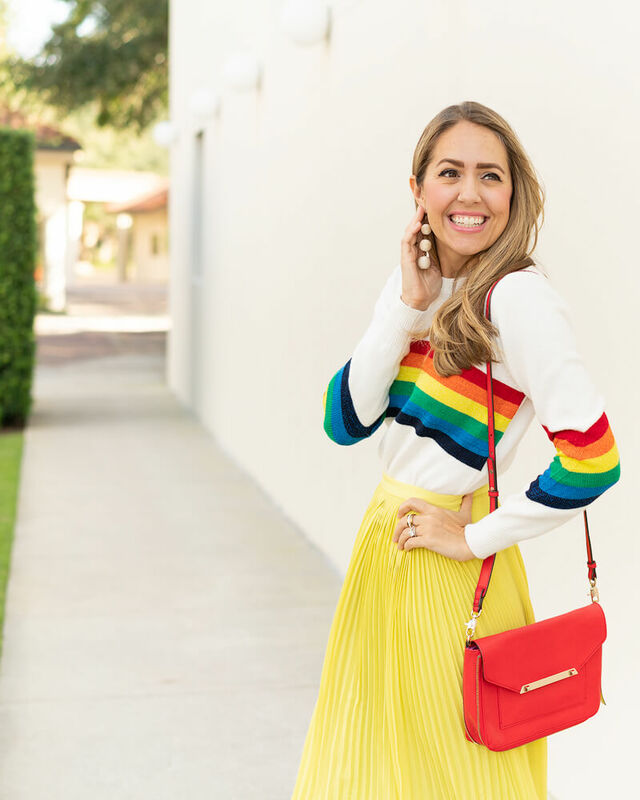 It’s written all over my face - this is such a fun, colorful look! Approx. dates: Purse is 5 years ago. Shoes are 4 years ago. Skirt is thrifted 1 year ago. Sweater is recent. It’s official: I’m wearing things that are a decade old. I’ve had both this ivory coat and camel sweater for a whopping 10 years. (Whoa!) I was inspired to wear them together by the colors on this plaid scarf, which I have quite the affinity for - check out 6 ways I’ve worn it, below. Lots of old things on the blog today but a new way to wear them together! Approx. dates: Coat and sweater are 10 years ago. Scarf is 3 years ago. Boots are 1 year ago. Jeans, earrings, purse are recent.